We originally wanted to fit a few days at the Costa del Sol (Spain’s South coast) into our latest trip itinerary, but we just didn’t have enough time. As a compromise, we decided to squeeze in a short day trip to the town of Nerja while we were staying 3 nights in Granada. Alsa, a bus carrier in Spain, runs 7 trips per day to connect the two towns. Each trip takes approximately 2 to 2½ hours and costs €10 each way. The bus station in Granada is not centrally located, but can be reached easily by local buses or taxi. The Nerja station is also not central, but is a quick 10 minute walk to the main retail and restaurant area or a 10-20 minute walk to any of the town’s great beaches. Although a trip back and forth is a lot to fit into a day, we thought our journey to Nerja was well worth the time investment. We experienced a whole new culture of Spain, and enjoyed some excellent sunshine, cheap food, and warm Mediterranean water. The ride to Nerja on the Alsa bus was very pleasant. The drive follows a major highway that skirts by the Sierra Nevada mountains. It passes over several dramatic gorges and by many wind turbines, both major feats in engineering. After reaching the ocean, if follows along the local road connecting all the coastal towns. There are at least 2 stops between Granada and Nerja. One nice surprise was that our Alsa bus to Nerja had free wifi on-board, which allowed us to do trip planning en route. We were not so fortunate on our way back. 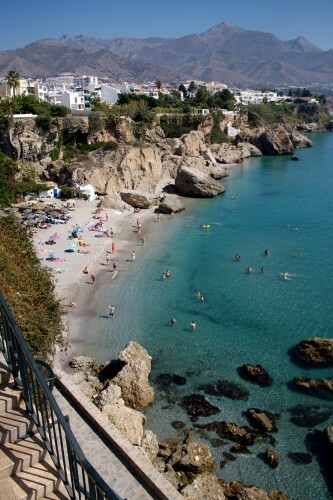 Once arriving in Nerja, we followed the road down to the Balcony of Europe, which is pictured above. On the way, we picked-up a beach towel for €6 (well worth it in comparison to dragging your own all around Europe). The Balcony of Europe offers some very picturesque views of the surrounding beaches, coastal mountains, and the expansive Mediterranean. Africa is likely too far away to see even on a very clear day, but it’s exciting thinking it’s just beyond the horizon. We decided to settle down at Burriana Beach, about 15 minutes east of the Balcony of Europe. In addition to having plenty of space to stretch-out, Burriana has a number of restaurants situated right along the beach. One of the most popular is Ayo’s Place, where paella is cooked in ginormous portions and served in unlimited portions for €6 per person. We enjoyed our paella with a pitcher of Sangria, and maximized the value of our lunch with a second portion. 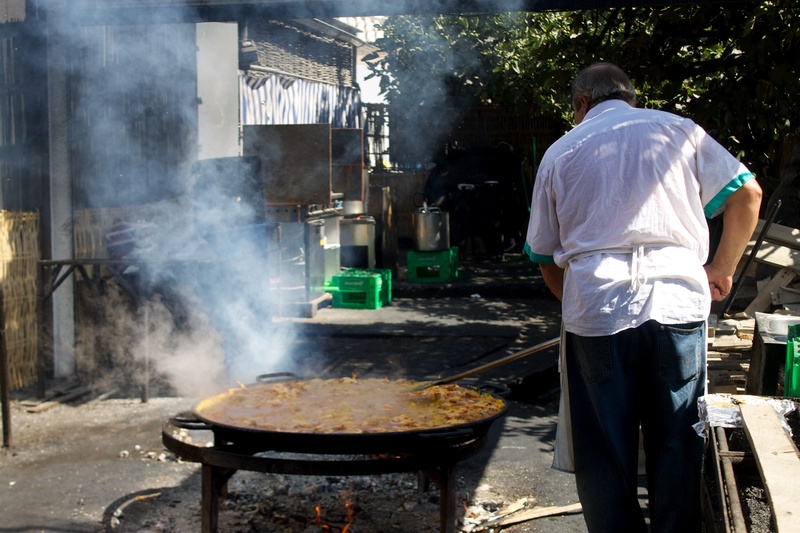 The paella was not the best we have in Spain, but was still very good and the experience was very memorable. Ayo cooks his huge portions of paella for customers at Burriana Beach in Nerja. We actually took advantage of the bathrooms at Ayo’s Place to change into our bathing suits before heading down to the beach. Although umbrellas and chairs are rented, we decided to just enjoy the beach on our beach towels. We spent about about two hours enjoying the sunshine and wading in the ocean. Unlike many Mediterranean beaches, Burriana is sandy (vs. rocky) and it’s southern exposure keeps the sand and water plenty warm. Although Costa del Sol is famous for it’s expatriate communities, it seemed like most of the people at the beach were Spaniards. After about two hours, we decided to call it a day and hiked back-up to the bus station for our trip back. You can buy return tickets from a kiosk adjacent to the bus station, which is what we decided to do because we were originally unsure of our return time. We made it back to Granada mid-afternoon, which allowed us time to complete some limited sightseeing in Granada before dinner. In retrospect, we were very pleased with our decision to visit Nerja. It was a relaxing break from a fairly intense sightseeing schedule in Granada and Sevilla. We have definitely learned that relaxation time is an important component to a European vacation, and can be especially useful when spaced between grueling sightseeing destinations. Nerja served this purpose in Andalucía. This entry was posted in Travel and tagged Europe, Granada, Portugal/Spain 2012 Trip by Ryan. Bookmark the permalink.